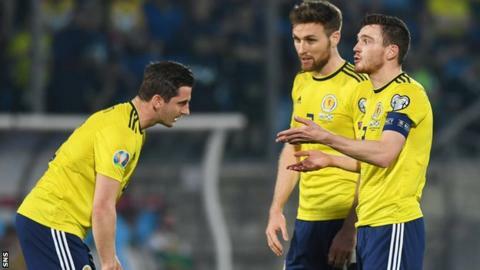 Scotland's play was affected by nerves as a result of fans booing during the 2-0 win in San Marino, says boss Alex McLeish. Members of the 3,000 travelling support jeered in stages throughout the Euro 2020 qualifier, with chants aimed at both McLeish and the Scottish FA. A defiant McLeish says the campaign "is never over" after losing 3-0 in Kazakhstan before defeating San Marino. "I have heard booing over the years during my career," he said. "Sometimes the players get nervous about that and that's why you don't get the free-flowing football you saw in November [When Scotland won their Nations League group]. "Over the two games we had a mountain of changes and it's not easy when you don't have momentum or rhythm." Kenny McLean gave Scotland a fourth-minute lead, but it took another 70 minutes before Johnny Russell doubled the advantage. Scotland face Cyprus at Hampden in June in their third match, before playing Belgium in Brussels three days later as teams attempt to finish in the top two spots in Group I to qualify for the finals. "We know the Russians are strong and Belgium are favourites, but it's never over this early in any competition," said McLeish. "There will be blips in the ensuing games and we need to be better. We have to get better and we need to get our best players in the team. "If the Belgians and the Russians don't get their best players into their team they'll have different results also." He added: "It's been a difficult weekend. "We knew 1-0 or 2-0 wasn't going to be looked at in a great light, but it was important for us to win after the disappointment in Kazakhstan. Everyone is hurting on that one.